What is 6061-T6 Aluminum And How Is It Made? 6061-T6 is used in aircrafts, electrical fittings, pistons, and bike frames to name a few. 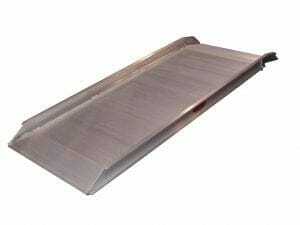 At Copperloy all our ramps use 6061-T6 aluminum. 6061-T6 aluminum is very hard and extremely versatile. No other metallic element can be used in so many ways. At our state of the art facility we manufacture the highest quality aluminum yard ramps, van ramps, twin lock and stage ramps – all with 6061-T6. 6061-T6 aluminum starts out as a clay-like soil called Bauxite. Aluminum oxide is extracted, refined, heated and filtered into a white powder. High heat hardening lowers the plasticity or flexibility and increases the yield strength, creating 6061-T6 aluminum. What’s 6061-T6 Aluminum Made Of? Any Special requirements For Welding 6061-T6 Aluminum? Yes. 6061-T6 is welded using tungsten inert gas welding (TIG) or metal inert gas welding (MIG) by our highly skilled and trained welders at Copperloy. But aluminum forms a thin coat of aluminum oxide that melts at a higher temperature, so before welding it is important to remove the oxide with heating to 350°F (176°C). 6061-T6 is much easier to weld at this high temperature and without this preheating 6061-T6 can develop weak or shallow bonds. All our 6061-T6 aluminum yard ramps, van ramps, twin lock and stage ramp ramps are prepped with acetone, rinsed in clean water, dried, and scrubbed with stainless steel brushes before any welding is started – it’s laborious but it’s the right way to do it and makes our ramps among the best in the industry. Some imports may be cheaper but they never get the job done properly or safely. All Copperloy’s aluminum yard ramps, van ramps, twin lock and stage ramps typically use 6061-T6 aluminum and our yard ramps use a solid support side rail structure. This side structure supports the entire capacity of the load. Some cheaper imports have welded tube supports that if bent cannot handle the original load. All Copperloy’s aluminum yard ramps have 8-foot level offs for easy access onto trucks, loading docks, and use 15-inch lips that overlap the ramp frames and rest solidly on the truck carrier bodies, dock floors, or platforms. The lip “floats” with the height of the trailer – if the trailer rises or falls, then our 6061-T6 yard ramps rise or fall accordingly. Fiberglass ramps may seem attractive from a price perspective but in the long run the gripping surface will deteriorate over time. Aluminum ramps however last indefinitely and they are light and easy to move – though a lighter weight, 6061-T6 aluminum yard ramps still have a rugged standard capacity of up to 25,000 lbs. Even in wet conditions you can be sure to have no traction worries due to our serrated sharktooth grating. We use 6061-T6 aluminum because it provides a very stable, very mobile working material for our leading edge yard ramps. You can feel good because it is 100 percent recyclable, non-toxic, green and easy to clean and does not rust. Our 6061-T6 aluminum ramps will last for years – maintenance free – so you can keep working safely. Copperloy has been designing and manufacturing aluminum ramps for more than 60 years. We are industry leaders and proud to say our products are “made in America”. Call us at 800-321-4968“>800-321-4968 to learn more about our full lineup of ramps and other equipment. Moving companies face many different decisions in terms of the equipment they utilize. These decisions are quite important too, as different gear can offer certain companies a competitive edge, significant cost-savings, or both. One such choice will be the type of ramp a company opts to use to load and unload from their vans and trucks, frequently coming down to a choice of aluminum ramps vs. fiberglass ramps. Which should you choose, and why? Fiberglass ramps are attractive for several reasons. They’re generally affordable, offering a minimal upfront investment for the company, and they’re also light weight, which makes them easy to handle. Another frequently touted benefit of the fiberglass ramp is that it typically comes with a gripping surface. This is a great feature, however, what many consumers don’t realize is that it’s also unfortunately a short-lived one. They need to be frequently refinished or replaced, after between two and five years of usage. This ends up offsetting that initial low price. Not only that, but the hassle of repair or replacement is another detractor, and could leave the company unexpectedly shorthanded during a busy period. Aluminum ramps on the other hand will last indefinitely. There’s no need for repair, and when they’re well constructed, they’ll hold up to the rigors of daily usage with ease. Additionally, many people wrongly assume that aluminum ramps must be far bulkier and heavier than fiberglass, but that’s actually not the case, either. Another benefit to aluminum ramps will be the added safety features which they come equipped with. Aluminum ramps have 3-inch runoff curbs, where as fiberglass ramps often just have a 1-inch runoff, potentially leading to more accidents. Aluminum loading ramps also feature shark tooth decking, which provides a non-slip deck surface for safe operation without ever needing replacement. While fiberglass ramps certainly have their applications, at the end of the day, the heavy workloads and demands of the moving industry are better served with an aluminum loading ramp. They offer a lower overall price of ownership, superior durability and enhanced safety features, and they’re underrated in terms of how easy they are to move around and work with. Copperloy has been producing high quality, proudly American made aluminum ramps for more than 60 years, and they remain an industry leader today. Call the team at 800-321-4968 to learn more about their full lineup of ramps and other equipment.